Summer is right around the corner and that means plenty of picnics, cook outs, and parties. I don’t know about you but usually when I’m asked to go somewhere in the summer I’m asked to either bring a side dish or a dessert. I have a ton of fun summer dessert recipes but I’m lacking in the side dish department. 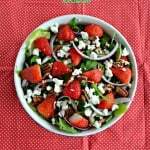 I’ve been doing some searching for healthier and more unusual spring and summer side dishes to get ready for summer fun. I’ve found some good fruit based side dishes, grilled veggies, and some salads. 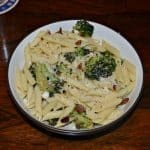 While I love a good broccoli salad I thought this Broccoli Pasta Salad was a fun twist on the classic. This salad has broccoli, sunflower seeds, onions, and cheese in it. 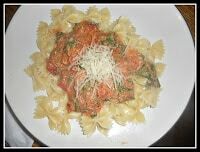 Then bow tie pasta is added in to make it more substantial. I also added in strawberries for color and sweetness instead of raisins or crasins. I definitely recommend using strawberries! The dressing is similar to broccoli salad dressing but it’s a little bit lighter and a little less sweet. I’m not big on sweet dressing with savory dishes so I only used a few tablespoons of honey. 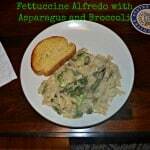 I really thought the creaminess of the dressing went well with the fresh vegetables and pasta. Another idea is to add in some raw bell pepper, grapes, or different kinds of cheese for another take on this salad. I used bow tie pasta because it’s easier to pick up with a fork but feel free to experiment with other pasta shapes as well. Give this side dish a try this summer, it might just be a new favorite! 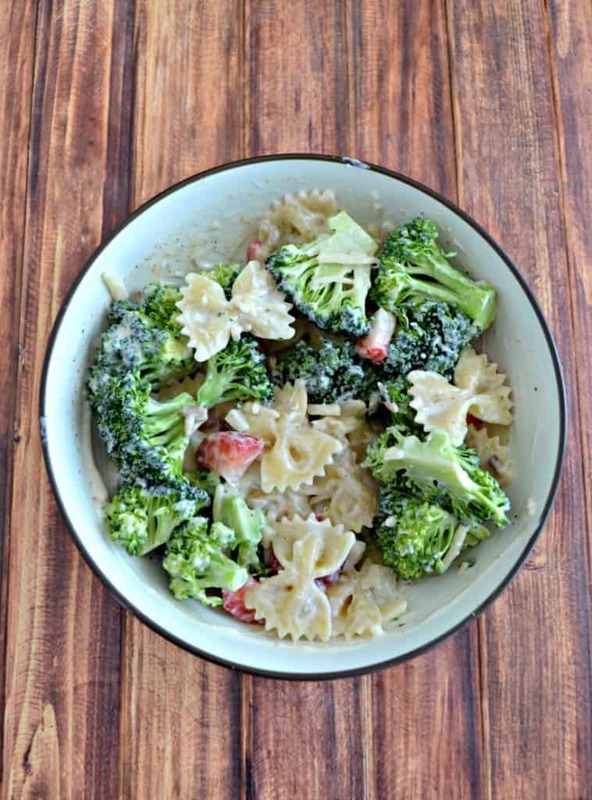 A delicious twist on the classic broccoli salad made with pasta and strawberries. In a large bowl combine the broccoli, onion, sunflower seeds, strawberries, pasta, and cheddar cheese. Mix well and set aside. In a small bowl combine the mayonnaise, garlic cloves, sour cream, vinegar, salt, pepper, and honey. Mix well. Pour the dressing on top of the broccoli mixture and mix well.